Upon your pre-dawn arrival in Shiraz airport, you will be cordially received by our representative who will direct and transfer you to your hotel. You will have time to rest and relax before our morning tour of Shiraz commences. Shiraz is crowned as the heartland of Persian culture and this city of sophistication will never fail to conjure up images of roses and nightingales, gardens and poetry. Early in the morning, relish in the highlights of Shiraz when it was the capital of Iran during the Zand Dynasty. Be inspired by the glorious Karim Khan palace, the splendid Vakil mosque, Vakil Bazaar and Saray-e-moshir with its splendid architecture and interesting ethnic souvenir shops, Nasir Almolk mosque. Our visit for Today is Persepolis. Founded by Darius I in 518 B.C., Persepolis was the capital of the Achaemenid Empire. It was built on an immense half-artificial, half-natural terrace, where the king of kings created an impressive palace complex inspired by Mesopotamian models. On the way to Zeinoddin or Fahraj, we will have a few short stops in Pasargadae to visit the most important and majestic monuments there. The tomb of Cyrus the Great, the originator and the great founder of Achaemanian Emperor, (500 years BC) is the oldest historical tomb. The wonderful architecture of his tomb, the huge fertile land over there beside the brave personality of Cyrus the Great inspires the visitors. This Archeological environment was the worshiping place for the followers of several religions and still it is so. Followed by the relief of the winged man and get familiar with its historical elucidations some researchers gave specific theories regarding the relation between personality of Cyrus the Great and one of the prophets of Holy Book. By visiting this majestic tomb you can have your personal comment about it. Old trees in any region are the symbol of archaism and tell the truth that appropriate weather and nice condition lead to long life. Abar Kouh which is a historical city is the place of historical sightseeing and wonderful desert architecture. Moreover the 4500 year old cypress tree in Abar Kouh is a marvelous attraction out there. These beliefs and the beauty of the 4500 year old cypress tree remain a trace of eternity in the heart and on the mind of all travelers. Mehriz is located 30 kilometers south of the city of Yazd. Mehriz consists of one central district and five village centers. Mehriz was known, during the late Sassanid era (4th century AD), as a natural pleasant area. The co-existence of the splendid fire temples and the holy sites of different religions astonish every visitor. In the afternoon the Fire Temple, Towers of Silence, the wind Towers in old part of the city will be visited. 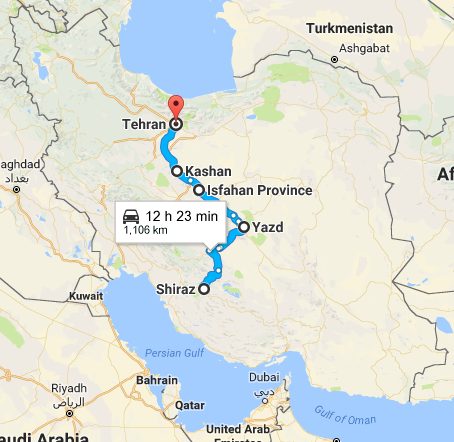 Today we will be driven to Tehran, and we will drive 200 Km to visit the UNESCO recognized village of Abyaneh, located at the foot of Mount Karkas and in the vicinity of desert. here we will appreciate the serenity of this quaint village with its splendid archaeology and meet the dwellers who speak, live and dress in the original Persian style. Next, hop on to Kashan and visit Tabatabaiha and Borojerdiha houses and some other historical places specially chosen by our tour guide and be acquainted with the previous century’s architecture, the Qajar era. Today we will be transferred to IKA, Depart Iran the land of warmth and hospitality with fond memories.